There was just too much talkin' going on in the fall of 1960! Joe Jones had been on the fringe of the music business for several years by that time, finally finding a large audience when he complained openly about his woman's incessant yakking. Joe humorously pointed out the problem ('...you even worry my pet!') on one of that year's biggest hits, "You Talk Too Much." But almost immediately Frankie Ford decided he could relate and appeared with his own cover version, then before you knew it, the women had to tell their side, and Valerie Carr released "I Talked Too Much" (using the same music as the original) while Martha Nelson spoke up with "I Don't Talk Too Much" (set to a different melody). It was all too much. Joe discourteously replied with "One Big Mouth (Two Big Ears)." The idea had been overexploited and everyone was ready for less conversation by the end of the year. Already in his mid-twenties by the start of the 1950s, New Orleans-born Jones had previously spent time in the Navy near the end of World War II, studied at the Juilliard School of Music in New York, and then returned to New Orleans to make a name for himself. First, though, he put in some time as a valet and occasional pianist for B.B. King, a hot property after his 1952 hit "Three O'Clock Blues," this leading to a few years of bouncing around the French Quarter clubs where most successful New Orleans acts broke in (just becoming a staple of that district's music scene was a claim to fame all its own). Add to that a stint backing Shirley and Lee on tour (another hot area act after "I'm Gone" became a national hit in early 1953), and Jones had racked up several years of steady work, with several more to go before achieving a hit of his own. His first opportunity to make a record came in 1954 with a Capitol Records release, "Will Call," but even the strength of a major label's promotion department couldn't make it happen. More than two years passed before Joe had a second shot, with "You Done Me Wrong" on the Herald label. Despite an unpolished vocal, the single had a solid sound, but Fats Domino or Smiley Lewis he clearly was not in a league with. Still, a third shot came for Joe with the Roulette label in 1958, and despite the Domino-esque "Every Night About Eight" and a follow-up single that failed to catch on, Roulette kept him on its artist roster. 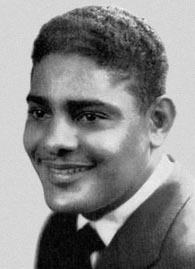 "You Talk Too Much" was written that year by Jones with Domino's brother-in-law Reggie Hall in the hopes that the Fat Man himself would give the song a try, but Fats wasn't interested. Jones, 34 years old in 1960, took another stab at it, re-recording the song with well-known local musician and producer Harold Battiste and making a deal with small New Orleans label Ric for distribution. The label's owner, Joe Ruffino, felt the song had potential, fronting Jones and Battiste several hundred dollars and sending them on the road to promote the song in the south. They took things further, hitting Chicago, Detroit and even New York City, getting airplay at stations along the way. The record caught on and hit the national charts...and Roulette stepped in, claiming it still had Joe under contract, effectively cutting off Ruffino and the Ric label from any chance of making a million bucks, as the record went as high as number three on the charts in November. The song's common theme had struck a chord with listeners and Roulette reaped the benefits, with the resulting cover versions and answer songs fueling the fire before the inevitable year-end burnout. Joe Jones is considered a "one-hit wonder" in some circles, but that isn't quite the case. In April 1961, Roulette released "California Sun" (wisely avoiding a dip into the "talk" trough one more time by promoting this side instead of the flip, "Don't Talk About Me When I'm Gone"). Written by Henry Glover, the song was well-timed for spring release with its notion of 'having fun in the warm California sun' and although the record had only a brief run on the national charts, its revival by South Bend, Indiana band The Rivieras made the song a surf-and-sand standard, reaching the top ten in 1964. Jones continued working in the business for several years, jostling his way in and out of recording sessions, live shows and promotional opportunites. In 1964 he hooked up with Jery Leiber and Mike Stoller's Red Bird record label at its inception, working with red-hot girl group The Dixie Cups (as producer of their number one hit "Chapel of Love") and Alvin Robinson (arranger on "Something You Got"). 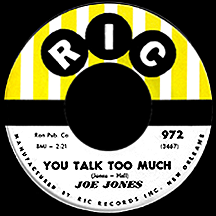 Having made very little money on "You Talk Too Much," Jones later became actively involved in the fight for fair artist royalty payments, challenging the label owners, both large and small, who often denied recording acts their share of profits in the early days of rock. His and many others' efforts helped lead to the reform of this practice and eventual reimbursement (if only in part) of lost royalties to founding R&B, rock and other long-overdue singers and musicians.